100 of the World's Most-Beloved Masterpieces in Two Volumes. Edited by E. L. Lancaster and Kenon D. Renfrow. Masterworks; Piano Collection. Masterwork; Recital. Book. 196 pages. Alfred Music #00-37316. Published by Alfred Music (AP.37316). 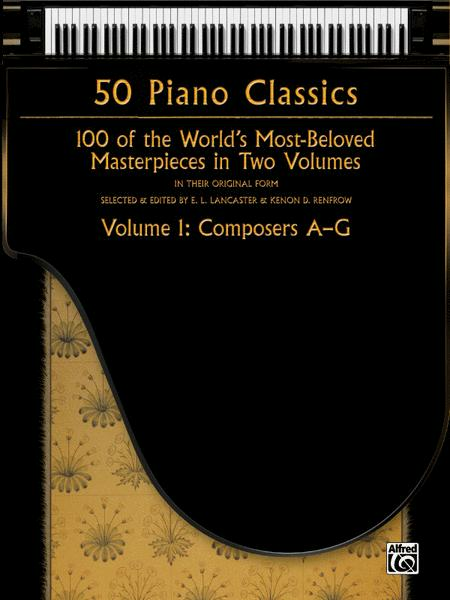 Chosen from the four stylistic periods of piano repertoire and presented in their original form, the 100 pieces in this two-volume collection have been favorites of pianists throughout the years. To help in performance, the editors have realized ornaments and added editorial markings such as phrasing, expression marks, and dynamics where appropriate. This first volume contains 50 pieces by composers whose last names begin with the letters A-G. Titles: Tango in D Major, Op. 165, No. 2 (Isaac Albeniz) * Invention No. 13 in A Minor, BWV 714 * Bear Dance (Bela Bartok) * Moonlight Sonata in C-sharp Minor, Op 27, No. 2 (Ludwig van Beethoven) * Intermezzo in A Major, Op. 118, No. 2 (Johannes Brahms) * Nocturne in E-flat Major, Op. 9, No. 2 (Frederic Chopin) * Clair de lune (Claude Debussy) * Juba (R. Nathaniel Dett) * Spanish Dance, Op. 5, No. 5 (Enrique Granados) * Notturno, Op. 54, No. 4 (Edvard Grieg) * Scherzo in D Minor (Cornelius Gurlitt) * and more. Excellent book, a companion to Volume 2.